Guys - I think it's about time I get this post out. Really any post, for that matter. Where did January and February go? I had big plans for this space. Why does it always feel like a huge shock or surprise when things don't go according to my plan? You think I would have learned by now that nothing ever goes according to plan. I've been wanting to share pieces of Italy that are special to me for a long time. This space feels like a good place to start. If you know me at all, it's no secret that I love Italy. I am so excited about these little travel collections for sharing a few photos from our most recent trip, plus a handful of my favorite spots to visit. I can count up to ten different families and individuals that have asked for my advice on Italy this past year. I'm thinking I should probably quit my day job, ya know? So - where to start? Firenze. That's Italian for Florence. A quick preface: there’s a lot about Italy that I don’t know. Like Italian, for one. Small talk? Sure. Fluent? Nope. (Trying to be? Yes. Hello, Duolingo!) 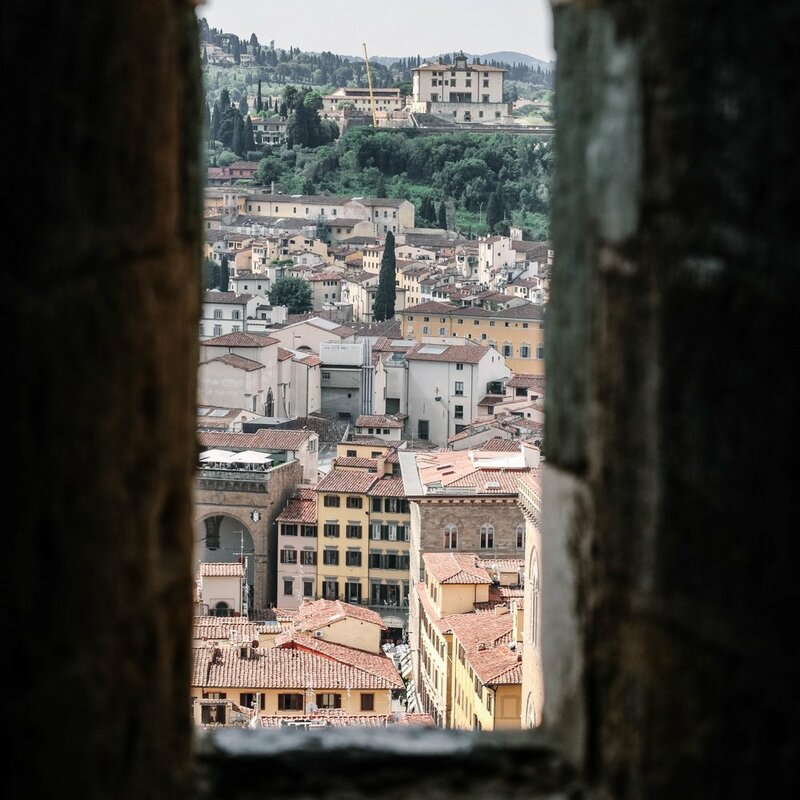 After many trips to Florence (from short day trips on study abroad to my most recent trip this past May) these have come to be the things that I’ve discovered - some by happenstance, some by recommendation. This is not everything that I've done and it isn't everything you should do. Some things are "tourist-y," some are not. That being said, there’s a lot more to discover, but maybe this will put you at ease one day, if you are tired and wandering the streets... you can count on these places. Can’t figure out where to eat lunch? Go here. Just trust me. Can’t decide if you want to hike to the top of the Duomo? Do it. Trust me. Where in the world should we get gelato? There’s only one place and it’s here. Trust me. 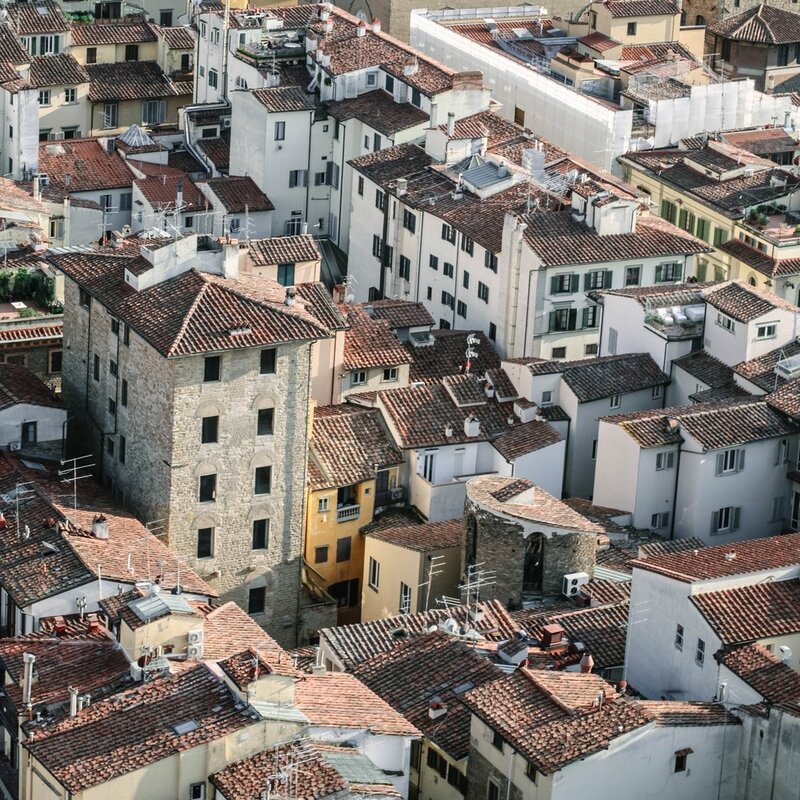 If you have some favorite spots in Florence that I should visit, share them in the comments below so that we can keep collecting places to experience the next time we are in Italy. Italy is a magical little place. It feels to me like a true home away from home. I wouldn't have second thoughts about relocating to this boot-shaped country. I was lucky enough to call the hills of Tuscany home for four months during the fall of 2013. I returned recently with my husband to celebrate his graduation from medical school and divinity school, our first year of marriage, and a big move to a new city. This visit was special because Luke got to be in my place. I was amazed by how familiar the culture felt to me. I slipped back into my rhythm of broken Italian. I was also equally surprised every single day. I have so much to learn and discover about this culture -- so many more cities and towns to visit -- but I think this is the some of the best that Florence has to offer. Firenze is quite a dream. You go for the art, or maybe the leather, but that's not why you stay. You stay for the views. I promise. This place is an artistic masterpiece in itself, a dreamy city tucked away in a valley of rolling hills. So, my biggest piece of advice when traveling to Florence is go up. Wherever you have a chance to get higher, take it. Get to the top of things and breathe in the amazing views. My ideal day in Florence starts off slow - morning cappuccinos... warm pastries... watching the workday rush hour at a small cafe. (I like this tiny spot.) Italians down espresso in one gulp, shout "ciao ciao," and move on. Then, it's a leisurely hike through the streets, across Ponte Vecchio and slowly winding up to the tip-top of Florence, Basilica San Miniato Al Monte, my favorite spot in the whole city. It's quiet here and more deserted than you'd expect, tip-toe through the church and circle around back through the old graveyards. Next, it's time to wander back to the city, down through the rose garden below the Basilica if they're in bloom. I'd end up outside All' Antico Vinaio for a grab-and-go panini and wine. Fresh focaccia bread that melts in your mouth, balanced by cured meats, sharp cheeses, and pesto. Yes, please! Then, an afternoon stroll around the river to end up at La Carraia for pre-dinner gelato. More strolls through the street, plus a late afternoon hike to the top of the Duomo at sundown. Jump into the night on the rooftop of the Westin Excelsior Hotel for happy hour with an aperol spritz and all-inclusive aperitivo buffet - bucketloads of bread, cheese, and prosciutto. Finish off the night at Trattoria Sostanza with fresh pasta, chicken in butter sauce, frizzante water, and a bottle of wine. Maybe grab dessert here... maybe stop by La Carraia for a second gelato. 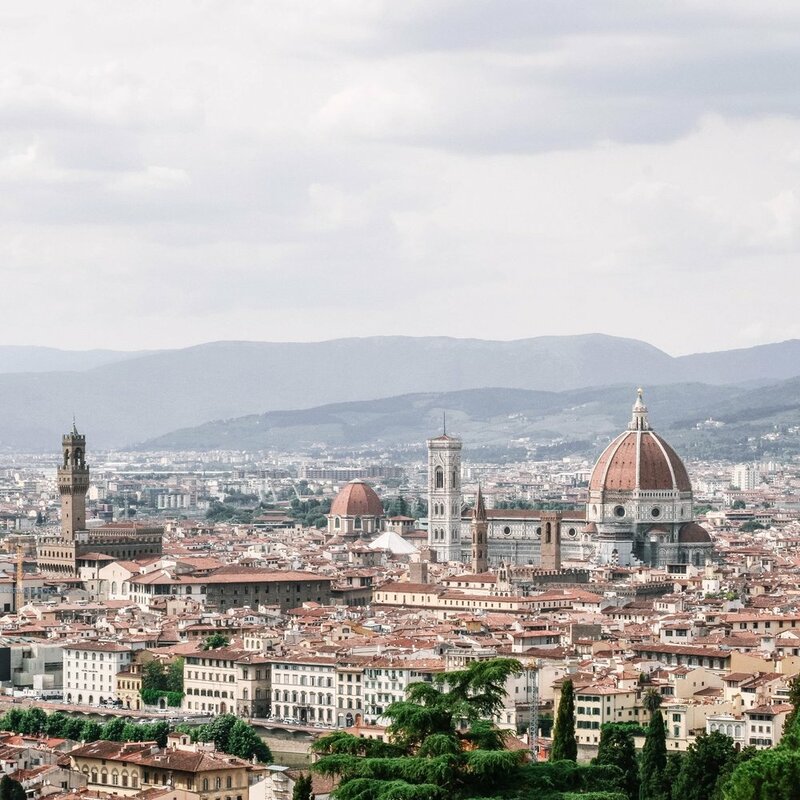 Florence is loads of good food, paired with even better views. I've shared this list more times than I can count. I've got more places hidden in my back pocket, so if you want an extended list, shoot me an email. It's everything I mentioned above, with extras. But if I'm going to Florence, these are nonnegotiable in my book. Basilica San Miniato Al Monte / For the best view of Florence. Take it slow here. Top of Florence's Duomo / For the best view in Florence. Also, take it slow here. And get ready to walk up a lot of steps. Westin Excelsior Hotel / Head to the rooftop for aperitivos, overlooking the river and the famous Ponte Vecchio bridge. Best at sundown. All' Antico Vinaio / Panini on homemade focaccia. This place is so popular that two identical shops exist directly across the street from one another. They offer exactly the same thing and there's always a line at both. Best grab-and-go panini in Florence. Grab food + wine, find some steps, enjoy the city. Trattoria Sostanza / Yummy dinner bistro. We received this as an excellent recommendation on our trip from a friend. I'd go back in a heartbeat. La Boite / A true hidden gem with only Italians that Luke and I stumbled upon because we were lost. Stop in for an afternoon prosecco and charcuterie board. Also, a great place to hole up if you need to get some work done on vacation. This list is so tiny compared to what Florence has to offer. I would love to hear what your favorite things are to do in Florence, so that if I end up back there soon, I can try them out. Feel free to leave a comment for your Florence must-dos. Lastly, for my art lovers and museum goers, below are a handful of spots that I've enjoyed. Great options for a potentially rainy day, or if you can't get enough of museums, like me! Alinari National Museum of Photography / For my photography lovers. The last time I was there, they were showing Ansel Adam's negatives. A breath of modern air in Florence. La Specola Anatomical Collection / This place is really weird and awesome. Basically, a taxidermy museum. Enjoy, dear friends! And let me know how your trips to Florence go!